AOL Mail gives you the personalized mail experience you've always wanted. 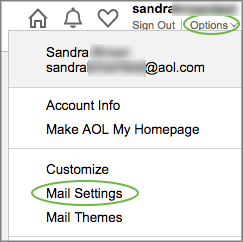 Learn how to update your settings to make AOL Mail look and feel exactly how you need it. AOL Mail can be customized to suit your every need. Personalize how you write emails, manage your incoming messages, the general look of your inbox, and more. 1. Sign in to AOL Mail. 2. Under your username, click Options | Mail Settings. 3. Click the tab for the setting you want to change. Where can I find each setting? • Today on AOL – Select the box to show latest news, unread messages, and mail tips. • Sender Name Display – Choose to display either the sender's name or email address. • Reading – Select how you want your emails to be displayed in your inbox. • New Mail – Select the sound you want played when new email arrives. • Mail Away Message – Create and enable away messages. • Auto Sign Off – Choose how long before AOL will automatically sign you off. • Contacts – Choose how you want your contacts displayed and sorted. • Cc/Bcc – Select whether or not you want Cc/Bcc displayed. • Default Compose Mode – Select how you want the compose screen displayed. • Write mail in a pop-up screen. • Write mail in full plane compose. • Write mail in a separate window. • Rich Text/HTML – Create a signature and enable Rich Text/HTML editing to use your preferred font and color. • Display Name – Enter the name you want displayed when you send an email. • Select if you want messages checked for spelling before sending. • Select if you want email addresses automatically added to contacts. • Select if you want a sent confirmation to appear on a separate page. Take control of your inbox by keeping your spam list up to date. 1. Click the Spam Settings tab. 2. In the box under "Block mail from addresses I specify," enter the email address you want blocked. 4. Alternatively, to remove the address, click the X icon next to the address you want removed. Create filters to make sure your incoming emails go where you want them to. 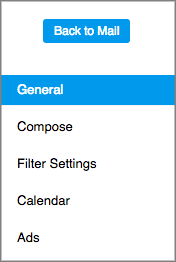 Once you've created a filter, you'll be able to edit or delete it from the same screen. Filters can be deleted by clicking the X next to "Edit." 2. Enter the parameters of your filter. 1. Mouse over the filter's name. 3. Enter the change you want to make. • Default View – Select your default view: Day, Week, or Month. • Time Zone – Select your preferred time zone. • Display – Choose what time your typical day goes from. • Reminders – Select where you want reminders to be sent. AOL Mail is supported by the paid ads we show. All ads can be removed by purchasing Ad Free Mail.